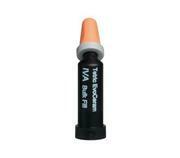 Tetric EvoFlow Bulk Fill is a flowable, light-curing radiopaque composite for direct restorations in posterior teeth. As its opacity increases during polymerization, Tetric EvoFlow Bulk Fill is also suitable for discoloured tooth structure. It is applied in increments of up to 4 mm as an initial layer in Class I and II restorations. Tetric EvoFlow Bulk Fill cures with light in the wavelength range of 400-500 nm (blue light).